You try your best. You bury the dead. The evil twin dies, and you say thank goodness that’s over with, and then you put her in a box and plant it in the dirt. You figure it’s a one-way trip, no refunds and no returns. At that point, it’s someone else’s problem. It always starts with a box. It often ends with one, too. Sometimes, it’s hard to tell beginnings and endings apart. Six months ago, Angelique Collins, sorceress supreme of the parallel lands, was murdered at a seance, while we were paying attention to something else. At the time, we thought the problem was that Count Petofi had stolen Quentin’s body, and was preparing to use the I Ching to travel through time and escape a pack of howling vengeance gypsies. We had no idea there was a whole other universe with seances and scientists and theme songs. This was totally off our radar. But we’ve had a crash course in parallel politics, and we’re all caught up with current events. The mistress of Collinwood is dead, survived by a house full of family members, gigolos, and devotees of the dark arts. And now, with her widower ready to marry and move on, there’s a swirl of rumors and whispers in the wind, suggesting that maybe she was just in Florence this whole time, transcending death, hijacking her twin sister’s body and generally having a marvelous time. Alexis, the purported twin sister, has spent the last three weeks trying to explain to everybody how genetics works, and that they need to stop following her around and raising an eyebrow every time she prunes a plant. This hasn’t worked. The whispers have persisted. The local residents have looked at it from every angle. They’ve tried seances and tarot readings and travel agents. They’ve asked her questions and fact-checked her answers. They’ve even tried strangling her, just to see what happens. It’s called extreme vetting. At this point, Quentin and Alexis and their scientist pal Cyrus have assembled at Angelique’s tomb, ready to pop the lid of her coffin, just to make sure she’s still inside. This is either a civic-minded investigation or a ghoulish defilement of the dead, depending on your perspective. It’s not often that you see mob mentality take hold like this when there’s only three people, but life is unpredictable. So is death, apparently. 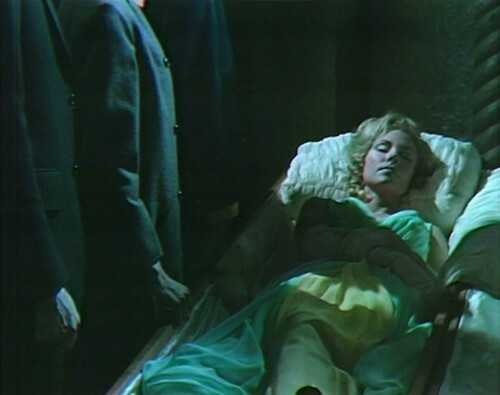 And there she is, the body in question: Angelique Collins, sleeping like Snow White in her crystal coffin, untouched by the hand of death. If she sees her shadow, that’s six more weeks of winter. Naturally, the survivors are shocked and upset; they were expecting Fair condition at best, and here she is, Near Mint. They apparently had a plan for every possibility but this one, and they don’t know what to do. “There is no scientific explanation,” says Cyrus, falling at the first fence. “There is no chemical explanation for a body that is this perfectly preserved.” And then they just look at her for a few seconds, waiting for somebody to remember how the scene goes. Okay, science didn’t work, the occult didn’t work. Anybody got a third option? So it’s a lovely scene, these three graveside lunatics squabbling over late-stage funeral arrangements. They’ve built up to this moment after weeks of suspicions and accusations, and the solution to the mystery is even more baffling than the mystery itself. 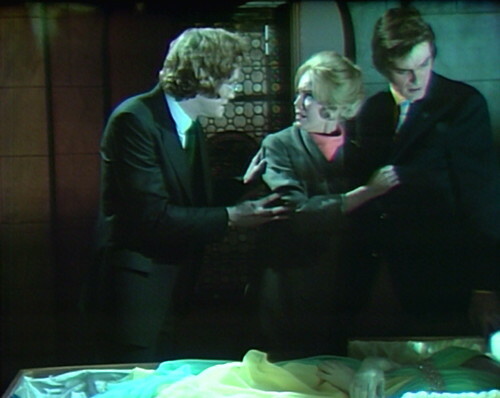 Dark Shadows doesn’t always stick the landing on these climactic reveals, but this one is rock-solid. For one thing, just the lighting in this scene is amazing. It’s supposed to be moonlight, I guess, streaming through a plate-glass window and turning everything a sickly underwater green. They do this a lot, this green-for-night lighting, but this is brighter than usual, and it’s never seemed so appropriate before. This scene takes place in another world, someplace desperate and unsettled, where the rules are made to be broken. Obviously, it’s up to Quentin to make the big decisions, because he is in charge of Parallel Time. So there you have it, the only sensible course of action: grab a torch, and light ‘er up. They’re at an impasse, so they follow standard soap opera protocol, which is to move to a different set and have the conversation again. Quentin bails on this iteration, so Cyrus has to do all the heavy lifting on his own. A good question, as always. Keep your eye on that “we at Collingsport” phrase, that’s the key. “Yes,” Alexis whispers, as somebody in the studio coughs, and Cyrus loses his place. It’s beautiful, a perfect moment of Dark Shadows realness. The lighting, the special effects and the clever plot twist are all very important, but to really put this over, you need that special touch of genuine, unfeigned fear. The plot point itself is fairly thin, if you take a second to think about it. What kind of spell is this? Apparently, Angelique has arranged for a personal prophylactic mummy’s curse that triggers a hard reboot, whenever somebody breaks into her crypt to check on how she’s doing. It’s inexplicable, beyond the realm of human understanding, and they have no plans to clarify. That’s the silly idea at the heart of this story. So you need someone to come on screen and explain it to us in an urgent tone of voice, preferably garbled and in the wrong order, while looking directly into the lens. Enter Cyrus, saying uncanny things in an uncanny way. It’s amazing. The Frid is strong with this one. So that’s how it works, this fractured fairy tale, where the wicked witch is awakened by true love’s kiss. Alexis returns to her sister’s side, taking one last look before she signs off on the cremation. They were never close, the way sisters are, but they’re about to get a hell of a lot closer. Alexis brushes against Angelique’s arm, just for a moment, and that’s the wake-up call that the witch was waiting for. Angelique has been dead for six months, biding her time. Now it’s time to get up, and go to work. 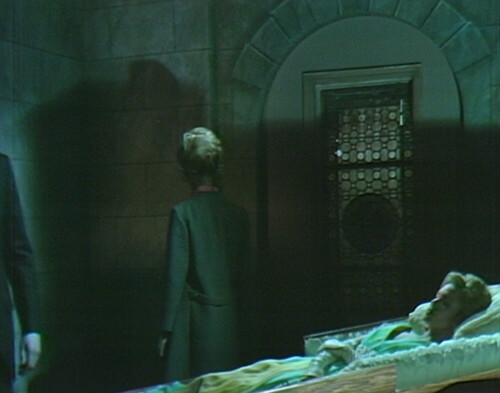 During the opening narration, as the camera pulls in for a shot through the wrought-iron door, it tilts up a little too high, and you can see the top of the set and a studio light. Cutting between the “live” footage and the pre-taped footage, there are some visual continuity errors. At the top of act 1, when we first see Angelique lying in the coffin, we see everyone’s hand resting on the coffin — Cyrus, Alexis and Quentin. When the camera cuts to show the three, Alexis has her hand raised up to her face. A boom mic is overhead when Quentin and Cyrus close the casket. A stagehand moves into the shot briefly when Trask closes the drawing room window. In act 2, Cyrus and Alexis have to hustle from the foyer set to Angelique’s suite, and when the camera focuses on Angelique’s portrait, you can hear them hurrying to the new set. Cyrus is a little out of breath for his first couple lines. When Cyrus closes the doors to Angelique’s room, the “Ode to Angelique” music cue stops abruptly. When Cyrus tells Alexis, “She and I shared a common interest in the occult,” the light outside the window is briefly obstructed by a person’s shadow passing by. 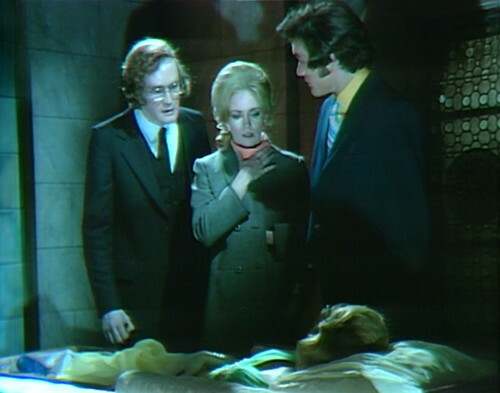 There are various kinds of trickery involved in the first scene, when Cyrus, Quentin and Alexis open Angelique’s coffin. This is how I understand it: there’s a mannequin in the casket, and they use another take for shots of Angelique’s face. Then Alexis turns away, asking the guys to close the casket. At that point, there’s an edit, and Lara Parker is in the casket as Angelique. Amber Brie is the stand-in, playing Alexis from behind. They return to the original scene with another edit, when Alexis turns around. At the end of the episode, there’s another clip of Brie standing in for Alexis, as she touches Angelique’s arm. Does this mean Dark Shadows has been responsible for the green tints afflicting TV and movies for the last 20 years?! gasp But how?!?! Oh, right — time travel! Very clever, Shadows. Very clever. Well, it’s usually blue, is what I’m saying. As for what Angelique is in this alternate reality, I suspect she starts out as a more or less ordinary woman, though extremely charismatic and rather well-versed in the occult, who after death somehow becomes something akin to a succubus — a supernatural undead and/or demonic female who sustains her unnatural life by draining life-force from others (usually men) through physical contact, often of a sexual nature. I think the writers were more or less making it up, but what they made up seems closest to a succubus. If memory serves, resurrected PT Angelique drains the life and energy (heat) from the living, so I thought she was PT’s version of a vampire or a succubus. Wasn’t there someone else who always got the chills and had to warm herself up? If memory serves me correctly, that was 1897 Laura Collins/Phoenix who was always getting cold. I was in high school in the early 2000s and was religiously watching reruns of Dark Shadows on Sci Fi. This was an episode I was so disappointed to miss! My memory may be faulty, but I seem to recall the closing shot of the previous episode was them opening the coffin and I was waiting with baited breath to see what was inside it the next day. Rush home from school, turn on the VHS… annnnnd no episode. Dad: “Oops, I guess I forgot to turn it on to tape today.” Back when MPI first started releasing the DVD sets, I came close to paying their outrageous price for the box set that had this episode in it. In the end, I couldn’t justify the cost to watch just ONE episode that I’d missed, so thank you, Danny, I now feel like I have some closure on this — it’s been bothering me for nearly 15 years! There’s also Video Dailymotion (whipser). Oh, it’s okay, kids. Granny’s just got a touch of the death today. Wouldn’t be so bad, y’know, if the ding-dang rheumatiz wasn’t acting up, too. Feels like I’m being embalmed by a G.D. monkey, don’t you know. This reminds me of how vampire myths were once perpetuated in Europe. They’d dig up the grave of someone who recently died and find that the face would have a deceptively healthy-looking ruddy complexion instead of the death-like pallor they were expecting. Then they’d assume the person hadn’t really died and would rise again as a vampire, so they’d drive a stake through the heart. Something like that. There must have been no Napoleon Bonaparte in parallel time. When they exhumed Napoleon after 20 years to move his grave, they found that he was perfectly preserved as if he’d been interred only the day before. Still, this is one of the fun and more memorable episodes of the parallel time period. Any time they dig up a grave or crack open a crypt to examine a body in a coffin is great with me. Nothing says “Dark Shadows” quite like checking up on the recently or not so recently departed. To me, the closing scene is marred by the bad editing. Not even a reaction shot (or sound) from Alexis after Angelique starts to talk. And a lousy horror music closing cue. It struck me as ineptly done even back in the day. Luckily, the next episode makes up for this–a lot. Slightly OT–Just saw Roger Davis (costarring with Ben Johnson!) on a 1971 Bonanza episode, “Top Hand.” Davis, fresh off of “House of DS,” plays a cocky foreman trying to show up Johnson, and he’s actually quite good in the part. Maybe he’s simply better when there’s time for rehearsal and retakes, like many an actor. The episode almost plays like a pilot for some other western, with the Cartwrights there as guest stars. Weird. I wonder if they were planning a Johnson-David western series…. Davis haters will love the scene where he’s dragged for half a mile by an angry horse he tried to rope. He gets all dusty but is otherwise uninjured. It’s called TV. 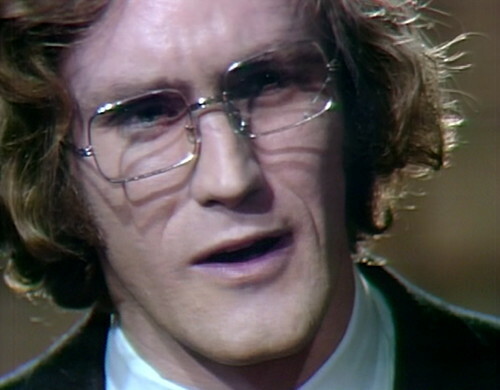 Roger Davis is often at his most effective in Westerns. This is one I haven’t seen. Thanks for posting about it. 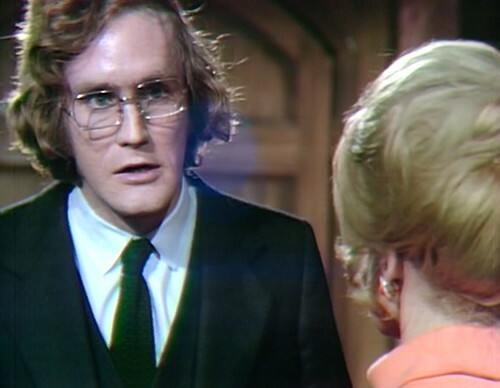 Davis haters and Dark Shadows fans in general may be intrigued by his performance in a Night Gallery episode from 1972 (“You Can Come Up Now, Mrs. Millikan”), where he plays a physician who is the very image of Christopher Pennock’s Cyrus Longworth, glasses and mannerisms and all. It is perhaps his most low-key performance ever. 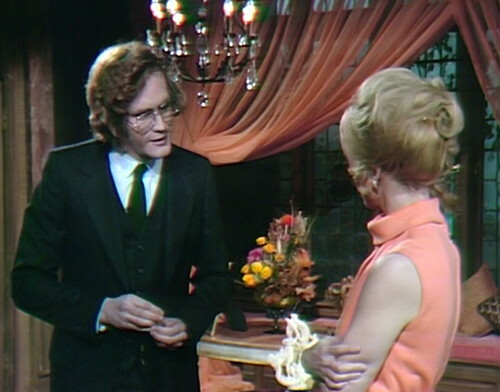 At one of the Dark Shadows Fests, I asked Roger Davis about working with Ozzie Nelson in this episode. Roger told me he and Ozzie were great friends. Roger did his Ozzie Nelson impersonation for me, sounding just like his Night Gallery uncle. Somewhere I saw the unedited footage of the Alexis/Angelique scene where (as I recall) we just have Lara doing the lines as Alexis. Anyway, she gets very upset that the TelePrompTer operator is going too fast or too slow. Lela Swift actually comes into the studio from the control room and gives Lara a pep talk. Given the limitations in technology at the time, they actually did a good job with this. I didn’t notice much in the way of actual electronic edits being made as I did carefully timed pauses in the Alexis footage so that when Angelique is chromakeyed over the Alexis footage, Lara was able to make Angelique’s lines fit in. I wouldn’t be surprised if they shot these segments on a weekend as it would be very time consuming if shot on a regular production day. Yeah. This footage came with the DVD series, in the last box. I assume it is in the coffin set as well. I also believe someone has put it up on youtube – I saw someone talking about this just the other day. …and didn’t Prisoner just post this on the blog recently? Put it up again for the relevant episode! Yes, there was a discussion recently about the same actor appearing as two different characters in the same scene, and what they were up against, about 20 posts or so ago. If Danny doesn’t include it as part of his post for 1001, I’ll post it here in the comments. They kept the dialogue simple–nothing requiring precision back and forth. Ingenious, really, esp. after the crummy teaser. I’ve seen the solo footage on YouTube. It’s probably been pulled. The fact that “Angelique” and the coffin were chromakeyed over the Alexis footage (wide shots) did make it look a little weird, what with the chromakey(ed) Angelique looking brighter and somewhat “flat” (not that kind of flat, LOL) since Angelique is on the chromakey set while Alexis is on the real set. But hey, it looks great for its time. Would that qualify as a generational loss, picture-wise, since it was taped footage vs. live? Yes indeed. And back then, each time you went down a generation, the video became more and more fuzzy. (Wow! In this day and age of digital video editing, it’s interesting to hear the term “generational loss.” Thanks – as a video editor (and former videotape editor from yesteryear) this really makes my day! I’m a sound person (amateur, but pretty intense), and I know about g. loss from audio dubs. Re digital, as much as I love analog sound, I’m incredibly grateful for digital and the ability to multi-track, record, etc. with no degradation in quality–it’s unreal. The ultimate example of analog sound decay is Les Paul’s huge-hit recording of “How High the Moon,” which he multi-tracked like crazy, creating hiss, general low fidelity (on the vocals, anyway), and cutting distortion (in what’s left of the high end). He used reverb to mask some of the flaws, but by and large it sounds low-end enough to be a third-generation cassette dub. Sorry–I’m in Off-Topic Land today. Must get back to the moment. Thanks for your expert input! Oh I remember that each time an audio cassette was copied, the hiss got worse and worse – especially with those “fast duplication” machines. One show that used chromakey really well was “The Electric Company,” which premiered a few months after “Dark Shadows” ended. They took a lot of time to make the chromakey effects look good. Here’s the main title sequence from the final (1976-77) season. Now that’s good chromakey for the 70s! Yes, it’s exceptional. This brings back memories. I was too old for the show (my sister was just the right age), but I remember the theme song well–one of the most annoying ever! I looked for Bill Cosby but didn’t see him. Was this post-Bill? I’ve been dubbing old (are there any other kind?) cassettes to my hard drive, and I find that Dolby does nothing but muffle the sound, so I leave it off and then adjust. My 25 yo Radio Shack (Optimus) deck still works beautifully, even after seven or eight years just sitting there. As you know, Dolby was such a big deal back in “the day.” The only thing that made the slow, thin tracks remotely hi-fi. I looked for Bill Cosby but didn’t see him. Was this post-Bill? You must not have read the Morgan Freeman interview in the latest issue of AARP Magazine. 🙂 It mentions Bill Cosby appeared in only Season 1 of The Electric Company. I remember seeing segments with Bill Cosby but never knew he was a regular. I found some opening credits with him but I only remember the one with the Short Circus. They could have fixed the color and hue to match, at least, on the chromakey. Considering how much time was put into the green Alexis footage. It made it look as if Alexis was being ‘drained’ of warmth, as she’s dressed in dark colors and lit more in blue, while Angelique’s gaining warmth, wearing a bright gown and lit with ‘hotter’ color. Well, that’s what I thought, anyway. Wait…I think Danny is right. I don’t think there’s any chromakey here. There’s a dummy in the coffin. The Angelique shots were shot separately and then edited in later. OK, I just figured out that I think the whole chromakey discussion is about the NEXT episode, 1001. No chromakey in this one (1000), I don’t think. 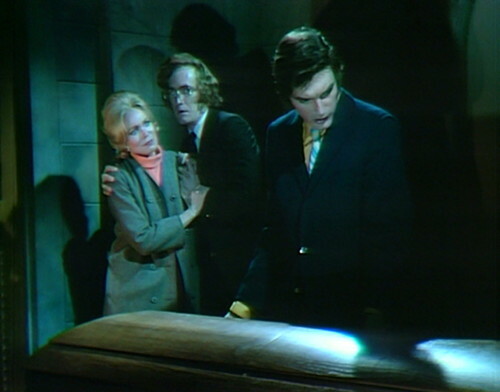 Of all the Dark shadows “coffin surprises,” this one bothered me the most. Perfectly preserved Angelique – with freshly sprayed French twist, make up, high heels and all -springing up from the dead is particularly ghoulish. Looks like we spoiled Danny’s next blog entry. Sorry. Ha, no problem. The comments is basically its own separate blog that happens to share a URL with the Dark Shadows Every Day posts.